It’s three years ago now that I was pregnant with Isla. And as this little baby’s due date (19th April) is just one week earlier than Isla’s due date was (26th April) all those milestones are happening at the same sort of time of the year. It is amazing though, because I seem to have forgotten pretty much everything from last time. What I can and can’t eat. When things happen. Is this/that a sign of anything? It’s like I’m a first time Mum again, and having to look everything up. This pregnancy seems to be completely different from Isla’s pregnancy though. When I was pregnant with Isla, with the exception of my headaches, it was pretty easy to forget that I was pregnant at all for most of it. I had no morning sickness, no cravings, no aversions. Nothing. Just that my headaches were worse that usual, and my stomach was getting bigger. Although the day before Isla was born I could still do my normal coat up, albeit it was a bit tight, and people couldn’t really tell I was pregnant. 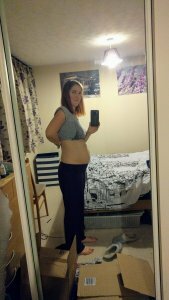 So how has my first trimester been different this time around? Well the main thing has been that I have been sooooooo much more tired. To the point that I was convinced it was going to be twins. I know it is much more tiring being pregnant while looking after a toddler, but oh my word, this has just been exhausting! Sometimes I really wish Isla still had afternoon naps, so that I could easily have a nap too…but she was awful at going down for a nap in the end, and wouldn’t sleep at night if she did nap, so it had to stop. So I have to cheat…put Cbeebies on TV, and try to get 10 minutes on the sofa if I can! I can smell things so much more this time around. And the smells linger! Isla has some pencils, and the smell of the wood on them just makes me want to be sick. It’s vile. And the smell sticks in my nose for hours on end, even if I go out of the house I can still smell them. So they have been banished to a cupboard, and Isla will be allowed to use them again in about 25 weeks! Foods that I usually love also smell horrible to me as well. I love, and always have loved, peanut butter, as does Isla. But this pregnancy, I cannot stand the smell of it, and have to hold my breath everytime I make Isla some toast or anything. My skin has been a lot more sensitive during this pregnancy. It’s a lot more dry and itchy, and irritated by….life a lot more! Although I haven’t had any morning sickness during this pregnancy either, which I am so thankful for, but I was feeling nauseous at the beginning over certain smells. Or while being a passenger on country roads…how much that was to do with pregnancy or my husband’s driving though, I don’t know! Like with my pregnancy with Isla, I went off chocolate and most other sweet things. They didn’t make me feel sick, I just didn’t fancy eating them. I’d rather have crisps and savoury foods (which could possibly be why Isla likes salty foods so much!) 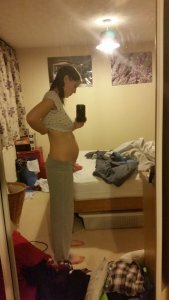 It lasted the whole way through my pregnancy with Isla, but as soon as she was born I think I ate my whole weight in Mars bars in the first month or so! 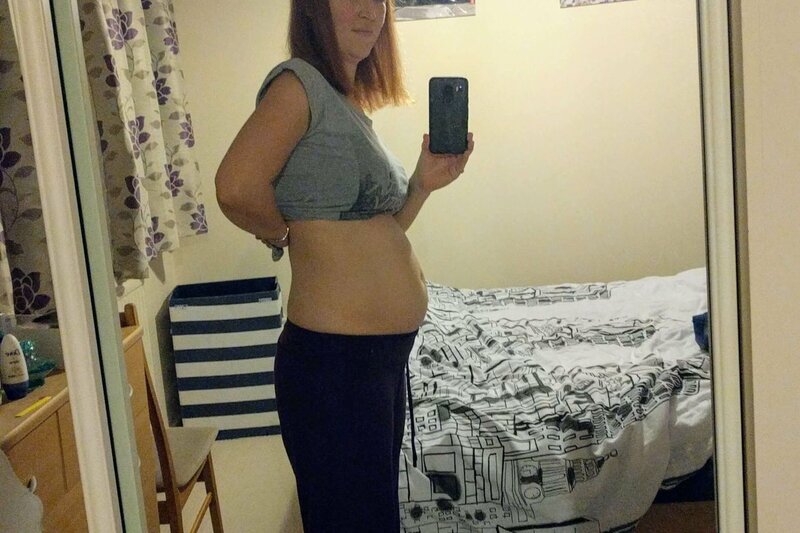 This seems to have disappeared mostly though in my second trimester, and I’m back to my normal self of eating sweet things…though not as much chocolate as I used to. As expected, my headaches have been a lot worse than normal. And probably worse than in my pregnancy with Isla. When I have had a headache I’ve been very sick with them, throwing up every half an hour for 2-3 days. Really not fun. Having been yet again referred to see O&G to discuss my headaches (and it being the biggest waste of 2+hours of my life, which also resulted in a £100 parking ticket!!) I was told pretty much all the information regarding medication I was told when pregnant with Isla was wrong. And so now I have been prescribed anti-emetics (medication to stop me from being sick), and so far it seems to be working. So, at least something slightly positive has come out of the £100 fine! I think this time my bump seems bigger, but then again I am a fair bit heavier this time around due to not losing loads of weight before I got pregnant. So this is how my first trimester has been. There have been a few similarities between this pregnancy and Isla’s, but there have also been so many differences too. Which is probably why I’d convinced myself that it was going to be twin boys!! So far, we only know that there’s only one of them in there. But on Friday we will be finding out whether it’s a boy or a girl. What do you all reckon? Isla has apparently decided it is a boy and it is called “Bus”…we’ll see about that one!